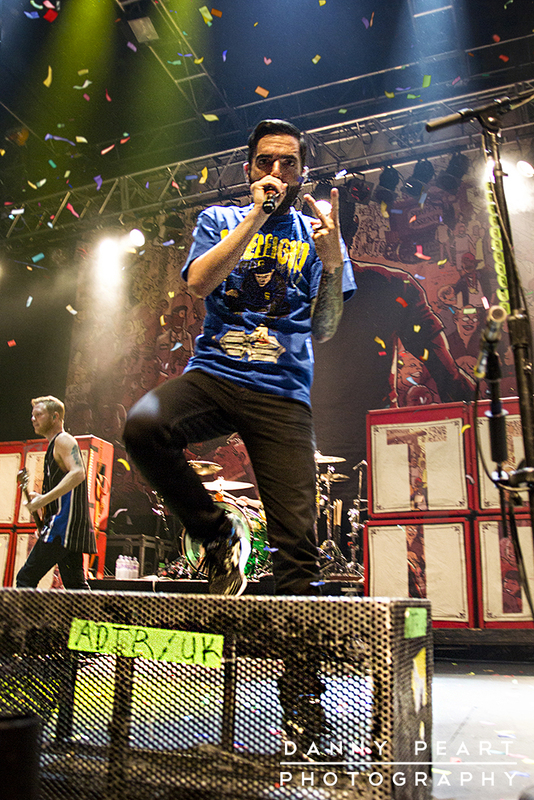 A Day To Remember return for a set of highly anticipated shows across the UK. The Florida quintet have made quite a name for themselves, and deservedly so with the quality of the live shows they put on. Tonight In Leeds a small crowd floods in as the doors open to be greeted by Decade who are to kick off tonight’s show. They have a good stage presence and eventually manage to pull in a big early crowd. A small set full of pop rock sing alongs from album ‘good luck’ is the perfect start to the night and get the crowd nicely warmed up. It’s been 4 months since we saw Lower Than Atlantis in a tiny venue in York, playing to a few hundred people fresh out of recording a new album. They didn’t lack in confidence, but there were a few sketchy moments, which were laughed off at a pretty fun laid-back show. Tonight they have a slightly tougher job at hand: getting a physical 2500 strong crowd ready for A Day To Remember. 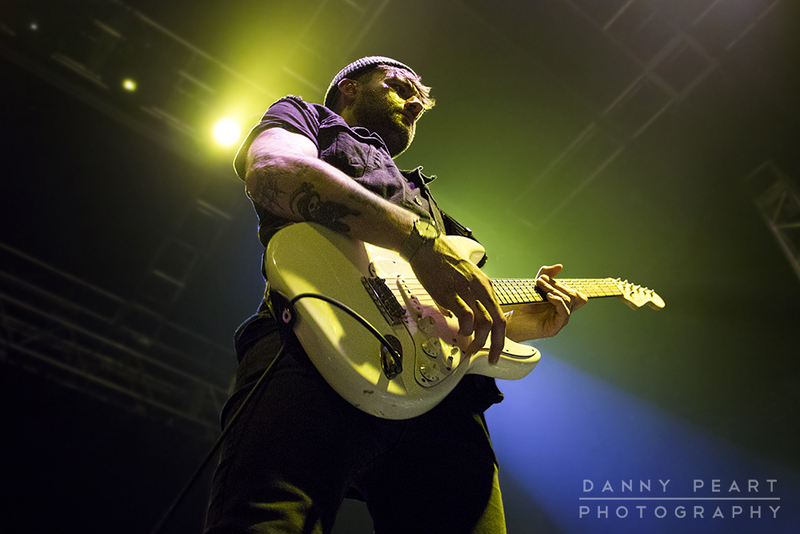 The lights drop and LTA take the stage, trying to get the crowd cheering and moving before the first song has even started as they stroll out comfortable as ever and get straight to the job. ‘If the world was to end’ and ‘Love someone else’ are perfect for the early crowd and definitely Gets the show underway properly with huge riffs filling the room. “If your gonna do something stupid do it now” shouts frontman Mike Duce, and sure enough that’s all that is needed for the crowd to get moving again. New single ‘Emily’ gets a great reception showing how well the new self-titled album has taken off in the UK since its release in September. “Anyone up for a dance off?” Mike shouts as he points out two over enthusiastic moshers near the front, as he Bribes the room with a free t-shirt to the best dancer, and it seems to do the job as the crowd show the band their best moves. A demand to see people jumping also gets the room bouncing for ‘English kids in America’ and the crowd don’t disappoint jumping and clapping from start to finish. The Watford quartet show even in larger venues, they are still laid back and up for a laugh with the crowd, filling the set with jokes and interacting with the crowd to keep them on their toes. “If you don’t know he words make them up it’ll be a laugh!” says Mike as the opening riff of ‘Deadliest Catch’ emerges for the older fans within the room. The set comes to a close with Lead single from the Self-Titled album ‘Here We Go’ which takes them out with a bang. Lower Than Atlantis do a great job of winning a few potential new fans with a full throttle confident display of hits and new tracks packed into a small half hour set, which is a highlight in itself for many people in the Academy tonight. 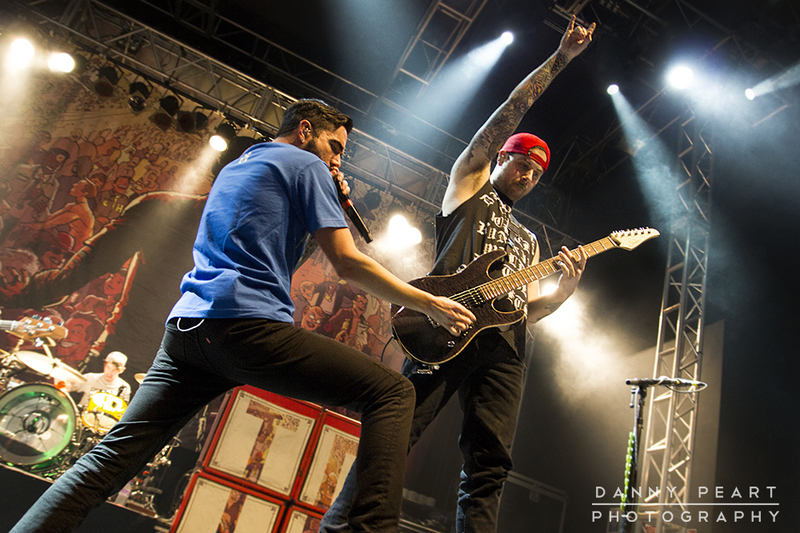 Tonight’s main course is A Day To Remember, who had a tough start to the UK tour with the first show in Portsmouth coming to a close mid set as a fan fell from the balcony at the Guild hall causing chaos and upset. However the anticipation of tonight’s sold out show is the perfect opportunity to get the UK tour in full swing. Crowd surfers are up early for the lead single ‘Right Back at it Again’ from album ‘Common Courtesy’ which kicks off with the heavy guitar riffs and CO2 cannons filling the stage with explosions of smoke to provide an early highlight of the set, only to be a teaser of what was to come from the rest of the set. ‘I’m made of wax, Larry, what are you made of?’ is another heavy anathematic belter to get the 2000 strong crowd on the floor of Leeds Academy jumping and singing along, with a big circle pit breaking out for the breakdown. 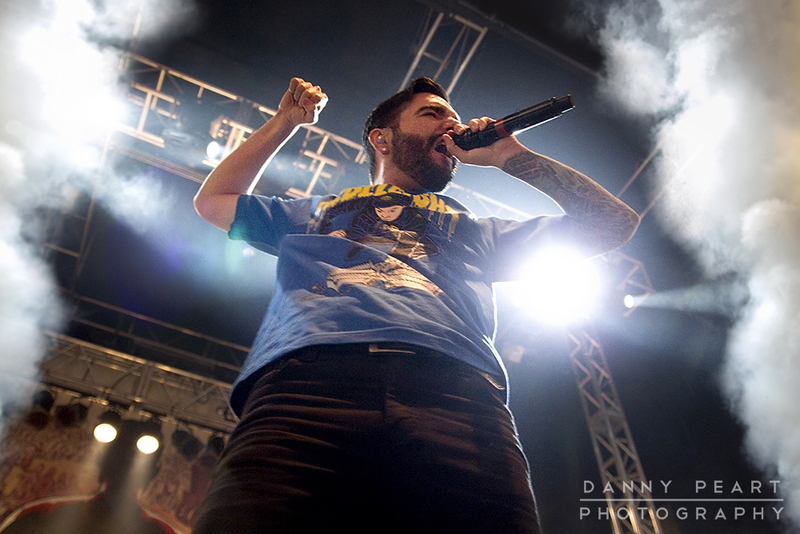 A Day To Remember fill the set with their heaviest, rockiest, catchiest anthems and a bunch of surprises to keep the crowd entertained to the maximum. Beach balls get punched around the crowd early on for ‘Monument’ and crowd pleasers such as ‘All I Want’ create highlights of the night. As the show comes to a close Dozens of rolls of toilet paper are being hurled around the room like a house party in full swing during ‘welcome to Lauderdale’ and an explosive night comes to an end with ‘The Plot to Bomb the Panhandle’ as frontman Jeremy screams “I wanna feel the earth shake!” Exactly that happens as everyone is of their feet for one final time to lose their minds as one final explosion of CO2 canons and confetti blow up across the room. 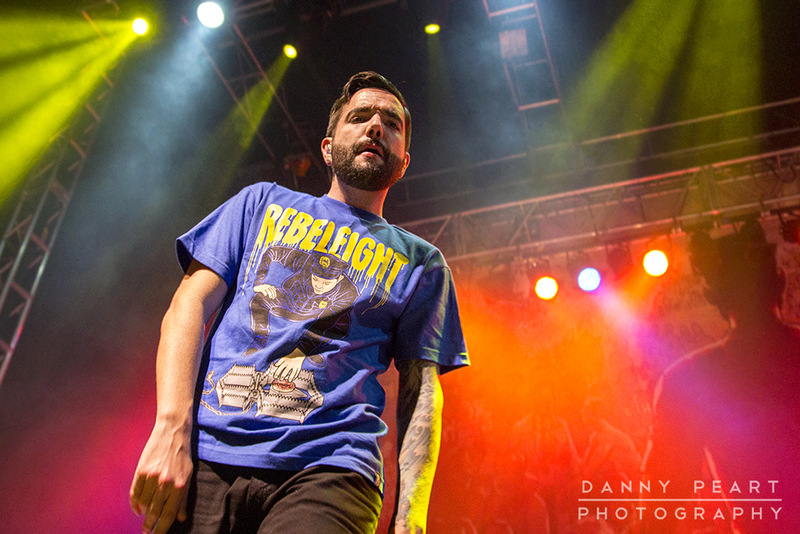 Tonight A Day To Remember pulled off one of the best gigs that the Academy has witnessed in a long time, and the Florida Rock band continue to show the world exactly why they are one of the best live acts about. Full marks to the guys on pulling off another incredible night! Go to the Live in Photos section to see more photos of all acts from the gig here!